Home / ANIMATED FILMS / Smurfette Joined by New Female Characters in "Smurfs: The Lost Village"
Smurfette Joined by New Female Characters in "Smurfs: The Lost Village"
In Sony Pictures Animation's Smurfs: The Lost Village, Smurfette has lived in Smurf Village her entire life... the same 99 boys every day. But now, she and her best friends are about to go where no Smurf has gone before… through the Forbidden Forest to try to find the Lost Village -- and they find the biggest mystery in Smurf history. It’s going to be the adventure of her life. “I loved playing Smurfette,” says Demi Lovato, who brings the character to life. 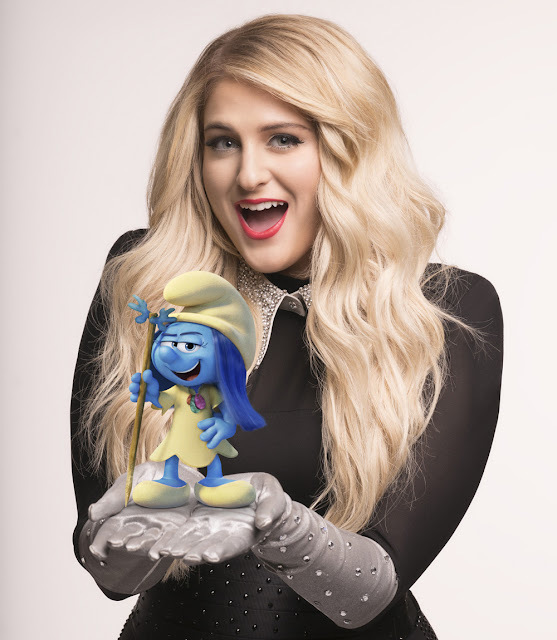 “She’s kind and compassionate and really takes care of her fellow Smurfs. But she’s also really brave – she’s adventurous and when she wants something, she goes and gets it. She doesn’t take ‘no’ from anybody, especially Papa Smurf. She’s a strong, independent lady Smurf. After surviving the Forbidden Forest, Team Smurf are suddenly set upon by strange masked creatures carrying spears. They’re trapped! But that’s when they realize – they have found the Lost Village (which is actually a village hidden in the treetops called Smurfy Grove). And not just that – there are new Smurfs! “They are not named after what they do – they’re named after nature,” says director Kelly Asbury. “They are not expected to do one thing and specialize – they can do many things, try different things. SmurfWillow (Julia Roberts) is simultaneously peaceful and fierce – a confident and gentle leader who has raised warrior Smurfs who are capable of anything. Anything she does, she does wholeheartedly. SmurfStorm (Michelle Rodriguez) is the no-nonsense, tough-as-nails warrior who immediately questions why Smurfette and the boys have come to Smurfy Grove. Her protective nature makes it hard to trust these outsiders. But through her tough exterior lies a heart of gold, and underneath it all, a girl who would do anything for her family and friends. SmurfBlossom (Ellie Kemper) lights up a room with her huge energy – she walks and talks a mile a minute, she’s never met a Smurf she didn’t like, and she bowls everyone over with her candy-sweet, bubbly personality. Her glass isn’t just half full, it’s overflowing. SmurfLily (Ariel Winter) is the whip-smart, no-nonsense member of the Lost Village. She’s not afraid to tell you like it is or to take charge – even when no one asked her to.